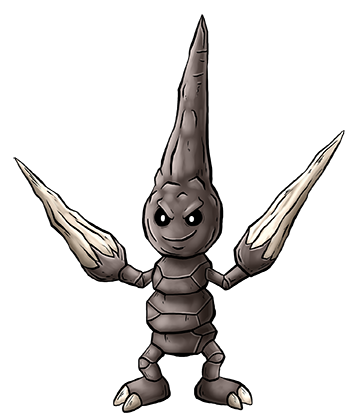 This Kreature is the meta-form for Stalagoid, which it can achieve via genetic patch. It has biological rotary motors for wrists which allow it to spin its stalagmites like drills, and they are harder than diamond, enabling it to bore through virtually any substrate. In addition to being skilled at combat, this also gives it plenty of utility in the civilian sector as a construction Kreature. Despite a lack of opposable digits, it has no difficulty feeding itself; it has a long, spoon-like tongue that it uses to scoop up tasty gravel.